Shanghai is a city of stunning contrasts. It’s where China first met the West and is now one of the most prosperous, dynamic cities in the world. 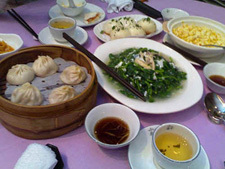 Shanghai is popularly seen as the birthplace of everything considered modern in China. With its cosmopolitan character, sophisticated and affluent consumers, and designation as a global city, Shanghai is considered the “showpiece” of the vibrant economy of mainland China. Its drive and dynamism exert a major influence over finance, commerce, fashion, technology and culture. It’s also home to many sumptuous brunches. 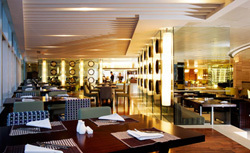 Tuck in to an all-day extravaganza of Asian fusion with Sunday Brunch at The Longemont Shanghai’s O2on2 all-day-dining restaurant. The unforgettable feast presents a wide selection from roasts to seafood, desserts and more. One of the most established and acclaimed deluxe five-star hotels in the city, the iconic The Longemont Shanghai continues to deliver an unparalleled level of guest experience to the most discerning international travelers. Rising over West Yan An Road with striking views, this 53-storey hotel has spectacular architecture and futuristic design, premier location and world-class facilities, and is one of Shanghai’s top landmarks. 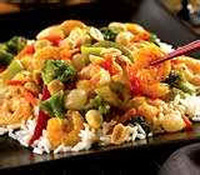 You’ll find an Asian fusion extravaganza at the Sunday Brunch at O2on2 at the Longemont. With seafood, sushi, sashimi, noodles, and desserts, western and oriental foods, hot and cold, O2on2 delivers an unforgettable feast for your every mood and taste. The restaurant is stylishly designed with clean lines and an airy ambience, and offers one of the most extensive selections of Asian and Western cuisines in Shanghai. One of the highlights of the brunch is the open char grill that cooks a range of seafood and meats to your individual taste. Everything is freshly prepared right in front of you in two open-style kitchens, where you can see the chefs create their masterpieces before your eyes. From green lobster tails to fillets of salmon cut into steaks, the char grill is a great showcase of the Longemont’s fresh premium seafood. Also offered are different cuts of high-grade imported beef and Australian racks of lamb. Other selections include sashimi, black caviar and salmon roe, Hong Kong-style barbecued duck and chicken, an Asian noodle station, stone-fired pizzas and a range of dim sums and mouth-watering Peking Duck wrapped in pancakes. Chocoholics of all ages will be unable to resist the multi-tiered chocolate fountains with cascading velvety smooth, mouth-watering quality melted chocolate. Every imaginable dip is available f rom exotic fruit to marshmallows, pastries and cookies – all skewered and attractively arranged on mini racks. The dazzling dessert wall is stacked with sweet delights such as soufflé, chocolate mousse, pastries, cakes and ice-cream. The brunch feast is enhanced with free flowing Moet Chandon champagne and red and white wines. 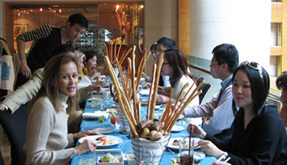 Every Sunday from 11:30am – 3:00 pm you’re invited to enjoy mellow jazz, gourmet international and local food and unlimited champagne at the relaxing Sunday Champagne Brunch at O2on2 at the Longemont in Shanghai.